Also known as the Vulture Head Nebula, LBN 777 is a very faint reflection nebula about 5 degrees northeast of the Pleiades. Surrounded by a dusty molecular cloud, LBN 777 also envelopes the dark nebula, Bernard 207. 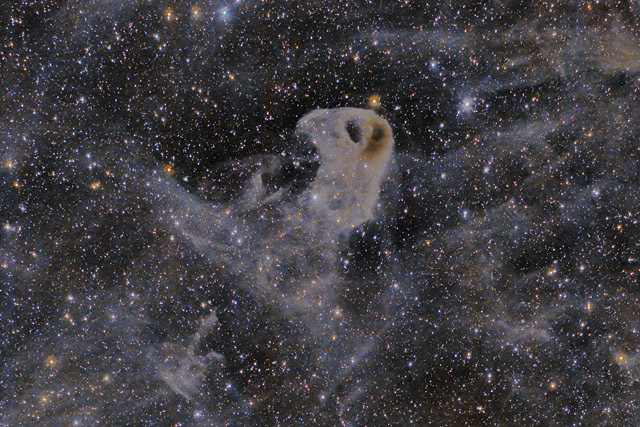 In this image, B207 can be seen as a brown patch to the right of the Eagle's eye. In this image, North is down. This image is cropped to 59% of the original image. Software Used Images Plus 5.75 for camera control. Images Plus 6.0 for calibration, stacking, digital development, feature mask, star shrinking and halo reduction, smoothing and noise reduction. Photoshop CS5 used for levels and curves, star shrinking, screen mask invert, lab color, saturation adjustments, lens correction, cropping and selective color. Pixinsight 1.8 for additional stretching and framing. HLVG for additional color correction, Gradient Xterminator for gradient removal. Carboni Tools for additional noise reduction and smoothing, Focus Magic for focus restoration. Registar for stack alignment. Notes I'm fairly happy with the final result of this image. However, I employed some very aggressive stretching techniques. The field of view also contains a range of background colors. As such, I'm a bit disappointed with the noise profile of the image. I think with some more refinement of my stretching technique, I can find a little better image hidden in the data. Nonetheless, its a tough target and I think the overall look is pretty good. This is the first image I've completed since my friend, Stephen Mounioloux, helped me fix up the collimation problems with the 600mm Nikon lens. The net result is that the corners look much better, and I was able to use the lens wide open at f/4. Thank you so much, Stephen! This image was published by Astronomy Magazine as its Picture of the Day for January 30, 2015 !